Children do not grieve like adults. In addition, no two children will grieve exactly the same way and each death experience will be different for the individual child. The first step in helping grieving children is to understand this fact and to take Dr. Alan D. Wolfelt's advice as he cautions adults not to determine how they think children should grieve, feel, or react to the death of a loved one. Instead, "parents and other caring adults must allow children to be the teachers. Children can teach adults what the experience is uniquely like for them" (Wolfelt, 1991, p. 11). 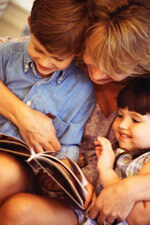 The National Center for Grieving Children & Families (The Dougy Center) has published some of the best informational books and resources concerning grieving children. From their book, 35 Ways To Help A Grieving Child (Dougy Center, 1999) we have taken the following Ten Ways You Can Help Your Grieving Child. To find out more about the Dougy Center and their publications, go to www.dougy.org. Click on any of the following or a brief explanation. 1. Listen, Listen, And Listen Some More. Don't give advice or make judgments. Reflect back what the child said using the child's words. Help the child accurately label feelings. When answering a child's questions about death and related issues, it is most important to give honest and factual information. Your child may not need to knew everything, but whatever you do tell him or her should be the truth. 3. Give A Child Choices Whenever Possible. Children have a more healthy grief experience when they are included in some of the decision making. Respect your child and his opinions as a valuable member of the family. 4. Encourage A Child To Play. Play is a healthy release for children of all ages. Younger children will also act out their grief through games. Observing and playing with grieving children can be very informative for adults. 5. Expect And Allow All Sorts Of Emotions. Create an atmosphere around your children where it is safe (understanding, accepting, and nonjudgmental) for them to express any and all emotions, thoughts, and feelings openly and honestly. Show them that there is no such thing as having a wrong feeling or thought. 6. Talk About And Remember The Person Who Died. Looking at photos, drawing pictures, and writing down thoughts and feelings about the deceased are very helpful activities for adults and children alike. Allow your child to begin a conversation at any time about the deceased and the circumstances surrounding the death. Listen and be supportive. 7. Give Assurances That Your Child Will Be Safe And Taken Care Of. This is one of the greatest needs of grieving children. Maintaining consistency in routines and activities will help to do this. However, be honest. Do not tell a child that you will never die. Instead, focus on your plan to be here a long time and all the things you do to stay healthy. Also, allow children to know of arrangements you have made in case of emergency and in the unlikely event of your death. 8. Be There At Bed Time. Bed time is one of the hardest times of day for anyone who lost a close family member. Tucking your child into bed, staying with him or her for a while, and even letting your child sleep with you will be helpful. Praying a simple prayer at bed time also can ease a child's mind and help him or her feel safe. 9. Plan To Spend Extra Time With Your Child. Your presence is the greatest thing you can give to a grieving child. Spending time with children and playing with them do wonders in helping them have a healthy experience with death. 10. Grieve As A Family. Do not be afraid to express your emotions or cry with your children. Being open with them will encourage them to be open with you and assure them that crying is OK. It can also prove to be a powerful bonding experience between the two of you. 11. Supporting Kidds: The Center For Grieving Children and Their Families. Supporting Kidds is a local, non-profit organization, dedicated to supporting and educating bereaved children, their families, and the larger communities in which they live. They offer a number of programs and services including: support groups; educational seminars; a state-of-the-art lending library; information packets about children and grief; and referrals to related services. We highly recommend Supporting Kidds as a resource to you and your grieving child. You can contact them by calling (302) 235-5544 or on-line at www.supportingkidds.org. Dougy Center (1999). 35 ways to help a grieving child. Portland Or: The Dougy Center For Grieving Children. Wolfelt, A. (1991). A child’s view of grief. Fort Collins, Co: Center For Loss And Life Transition.